"2018 SWOCC Elliott State Forest Draft Recreation Plan" Authors, Instructor, and Field Guides, West Fork Millicoma River, Elliott State Forest, April 17, 2018. Photograph by Anne Farrell-Mathews, Southwestern Oregon Community College (SWOCC) staff photographer. 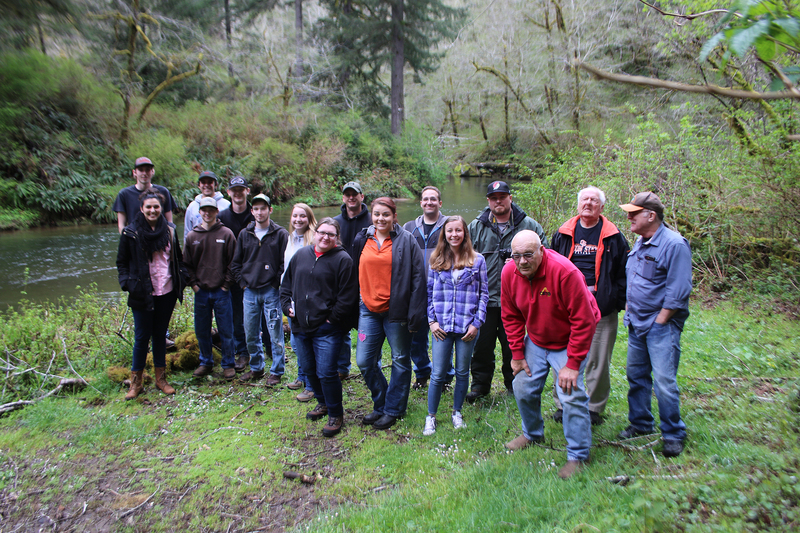 Students were asked to develop topical recommendations for maintaining or improving recreational opportunities on the Elliott State Forest for the advantage of the landowner, the Oregon School Trust. These opportunities would focus on legal requirements of net income and/or educational value for Oregon students and interested public. Chapter 2: 1) Forest “zipline” attraction(s). Chapter 7: 1) Increase hatchery fish runs; 2) improve hatchery visits; 3) conduct fish research. Chapter 8: 1) Improve fish habitat. Chapter 9: 1) Limit access to birds during nesting season; 2) conduct bird research. Chapter 10: 1) Use of herbicides for vegetation management. Chapter 12: 1) Install commercial communication towers.